Embryo and sperm samples are triple checked and labeled prior to storage in cryocans that are regularly topped up with liquid nitrogen. Sperm and embryo samples are double-checked by our embryologists to ensure that correct samples are used. 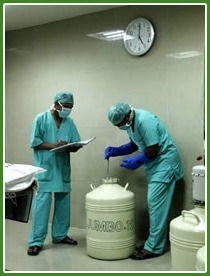 Samples are then checked by our senior embryologist, IVF physician and nurse-in-charge, prior to embryo transfer or use during ICSI.